‘ PerthNow ‘ is reporting that a man has been killed by a shark while bodyboarding with a friend in south-west Western Australia this afternoon. 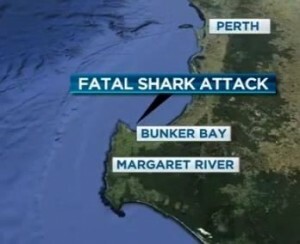 The attack occurred at Sugarloaf Rock off Bunker Bay, about 250 kilometres south of Perth. PerthNow understands the man is originally from the eastern states. According to Mr. Clifford, the victim was bodyboarding at the time with a mate and also three of four to five others were in the water at the time but unfortunately he was taken from the lower part of the body. Hamish McLeay, Bunkers Beach Cafe manager, said the water was full of people when the shark attack happened. Mr. McLeay had managed the café for six years but this was the first major shark attack he was aware of in the area . “We were just going for a walk along the beach for Father’s Day and two young blokes came running up to us trying to get people out,” she said. “There were mainly surfers in the water and everyone cleared out pretty quickly. People were just in panic. “They pulled him out of the water and there was a lot of blood on the beach. There was just no hope, he was cut in half. The attack happened about an hour’s drive from Gracetown, where 31-year-old Nicholas Edwards was killed by a shark last year.